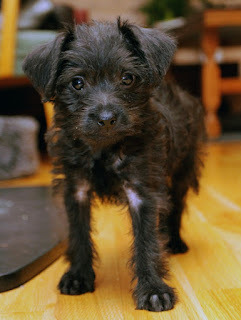 Pinny-Poo is a cross between the Miniature Pinscher and Poodle. These little dogs are medium to tiny by size, depending upon the size of its poodle parent. With their protective, possessive nature, these toy dogs make a good watchdog as well. They can either have a short coat like the min pin, or a long one like the poodle. Their elongated face ends in a prominent, dark muzzle and small beadlike eyes. Their triangular ears covered with very short ear hair, hang down to their cheeks. Considering their characteristics and good behavior, they can be a good choice for apartment dwellers. 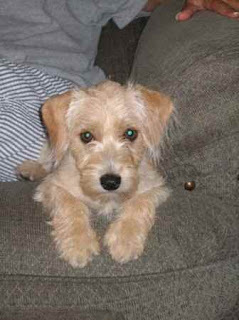 The Pinny-Poo is a small mixed dog being a cross of a Miniature Pinscher and a Poodle (Toy). He has a life span 10 to 15 years and takes part in competitive obedience and watchdog. He is a great dog for a family, couple or single person and he adapts well to apartment living. Other names he is known by are Min Pin Poo, Miniature Pinscherpoo, Pinny-Doodle, Min Pin Doodle and Miniature Pinscherdoodle. He is a sweet and sensible dog. Although the Pinny-poo is a recent hybrid created primarily for companionship, she comes from two proud, super smart, hard working breeds. The extremely popular Poodle has roots in water retrieving as well as truffle hunting and even circus work, whereas the Pinscher was mostly used for hunting and exterminating varmint. A pinny poo playing with leaves is a common scene. Though adaptable to all weather conditions, pinny poos might get cold in cold weathers and feel more comfortable in sweaters. With no history about the Pinny-Poo or anything known about who, where and why all we can really do is look at the parent breeds but keep in mind while the intention might be to get the best of the parents into the puppies this is not something that can be guaranteed. Even in the same litter variations happen in looks and in temperament. Min Pin and Poodle crosses will vary much more in temperament than their purebred predecessors. This hybrid may be more Poodle like or have more of the Pinscher personality, perhaps it could even be an equal mixture of both! In general, the Pinny-poo temperament is best described as energetic, vibrant, playful and very, very smart. This breed is also usually very sweet towards its family and will enjoy being in their presence, although they aren't overly needy and should be fine while the owner is gone for his/her daily activities. This breed is better suited for older kids that are not rough or annoying to it- kids that have been taught how to appropriately handle a pet. Although this breed is protective, they are also pretty quiet and only bark when they feel it is necessary to alert you. Note that it's important to socialize them early because, while many get along just fine with household pets, it may be more difficult for them to fit into a household with multiple dogs. Both parent breeds are very smart and very trainable so with firmness and consistency you should find them quite willing to please. To have a healthy dog you need a healthy puppy bought from good breeders who take care of their dogs and who can show you health clearances for the parents. A Pinny-Poo can inherit issues from his parents. Those include Addisons, Cushings, epilepsy, hypothyroidism, patellar luxation, eye problems, Von Willebrands, Legg-Calve-Perthes, Joint dysplasia and skin problems. Though, being little dogs, the Pinnypoos do not need lots of space, but they love to run around and play, jump high, dig and so on. For this, it is always good if you have an enclosed yard for this playful canine. Keep it without a leash when at home. They would remain active all day, playing with your family members, while burning their calories at the same time. However, like other dogs, take them out for a short walk or jog ever day. They are great runners. Though they are born intelligent, training a Pinny Poo might require a good level of patience at times. Some pinnies can be difficult to train, and hence, it is always advisable to begin training right from the time when you bring your puppy home from your breeders. Because they are often restless and protective, teach them obedience and the etiquette of good behavior with your friends and neighbors, or other dogs. Socialize them well, so that there would be no behavioral issues in future. Also, take the lead when you take your dog out for a walk, and act like the leader always. This should also make it clear to them that it’s you who is the leader of its ‘pack’. He can be hypo-allergenic with the right coat as mentioned. He is usually low shedding so there is less clear up to do after him. He will still need brushing but a couple of times a week may be sufficient. He will need a bath when he gets dirty using a dog shampoo. If his coat is long like a Poodle's he may need regular trips to a groomers to trim it. He needs his ears checked for infection and wiped clean once a week. His nails will need trimming when they get too long being sure to not cut too low. Teeth should be brushed at least twice a week. The Pinny-Poo is good with children, affectionate and playful but needs to be supervised especially with younger ones to ensure he does not get hurt considering his size. He does also get on well with other pets even cats. However where the socialization comes into play is how he gets on with other dogs as he can be aggressive towards them. Is the Pinny-Poo the Right Breed for you? Moderately Easy Training: The Pinny-Poo is average when it comes to training. Results will come gradually. Not Good with Kids: In isolation, this dog breed might not be the best option for kids. However, to mitigate the risks, have the puppy grow up with kids and provide it with plenty of pleasant and relaxed experiences with them.